Cisco 1941 with 2 onboard GE, 2 EHWIC slots, 1 ISM slot, 256MB CF default, 512MB DRAM default, IP Base. Cisco 1900 Series Integrated Services Routers build on 25 years of Cisco innovation and product leadership. The new platforms are architected to enable the next phase of branch-office evolution, providing rich media collaboration and virtualization to the branch while maximizing operational cost savings The Integrated Services Routers Generation 2 platforms are future-enabled with multi-core CPUs, Gigabit Ethernet switching with enhanced POE, and new energy monitoring and control capabilities while enhancing overall system performance. Additionally, a new Cisco IOS® Software Universal image and Services Ready Engine module enable you to decouple the deployment of hardware and software, providing a stable technology foundation which can quickly adapt to evolving network requirements. 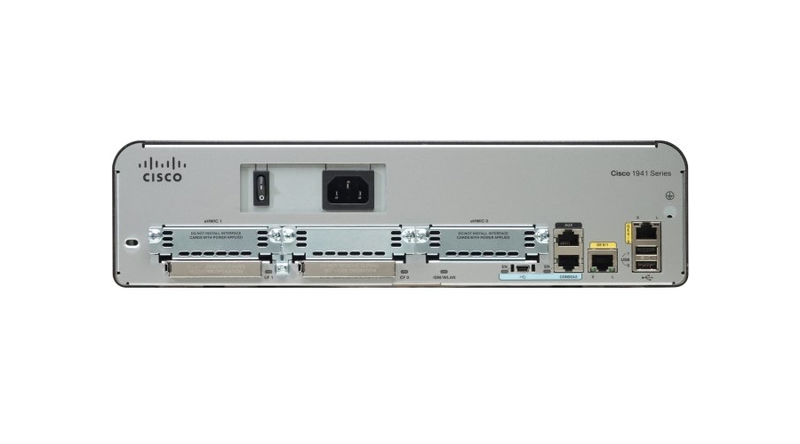 Overall, the Cisco 1900 Series offer unparalleled total cost of ownership savings and network agility through the intelligent integration of market leading security, unified communications, wireless, and application services.